Many would say that having a dishwasher is considered a luxury, after all, you can wash dinner and kitchenware by hand. However, for some it is a necessity, reducing the time it takes to wash, soap, and dry dishes and utensils. Regardless if you’re using a dishwasher as a luxury or a necessity, it is important to understand its lifespan so when you encounter any problems with it, you will be able to decide whether a repair or replacement is needed. A dishwasher’s lifespan is about nine years and it may be longer if you use and maintain it properly. Proper maintenance means that a dishwasher should be cleaned and inspected regularly. It also includes cleaning out the filter whenever you see that it is dirty. If you think your dishwasher isn’t working the way it should, you might think that repairing it yourself is a good idea, especially with different DIY tips available online. However, some problems may be more serious and dangerous than they seem so it is better to contact an appliance repair company rather than troubleshoot the problem yourself. Below are some of them. One of the most common complaints with any dishwasher is that it is unable to clean dishes efficiently. This is usually caused by a dirty filter and cleaning it is the logical solution. However, if the dishwasher continues to experience the same problem after you have cleaned the filter, it may be having other issues, like a malfunctioning component. Just like any electronic appliance, a dishwasher needs electricity to run. If you’re dishwasher doesn’t run even if it is connected to a power source, it might mean that it’s wiring is damaged. A faulty door latch or door latch switch may also cause this problem. If there are no issues with your power outlet or the dishwasher’s door, then the problem may involve the unit’s electronic components. Another common dishwasher problem is water flow. A defective inlet valve either does not fill the dishwasher with water or won’t stop filling it. If this happens, it also affects the unit’s dishwasher float or float switch, which are components that tell your appliance that it is already holding the proper amount of water. A leaking dishwasher not just creates mess in your kitchen but it can also do damage to your other appliances. Leaks may be caused by cracks or holes to the unit’s drainage hose or its gaskets. Damage to the pump or pump seal may also result in leaks. If your dishwasher fails to drain water, it might mean that the drain or filter is clogged or that the drain hose is defective. It might also mean a broken drain pump or drain sensor. When the cleaning cycle is complete, your dishes should come out dry and ready for storage. However, if your dishes are still wet after a wash cycle, then there may be a problem with the unit’s heating element. If your unit has cracks inside, its mechanical parts can be easily exposed to soap and water. 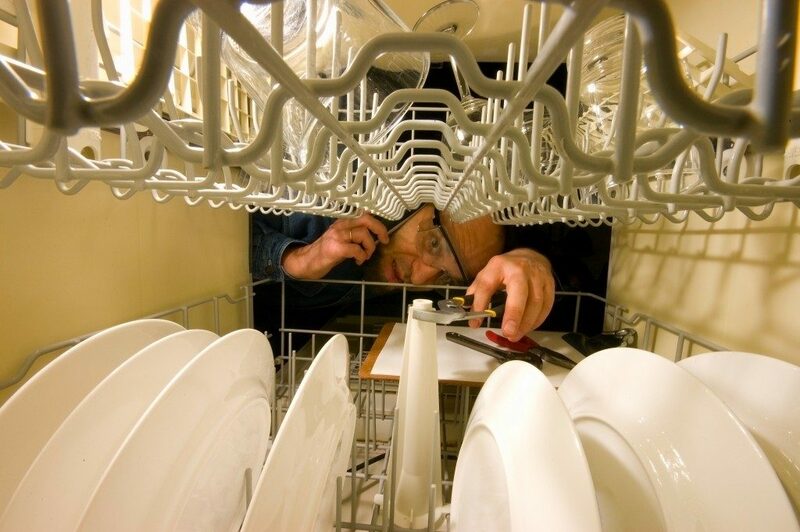 Cracks inside a dishwasher are usually difficult to repair and your repairman might recommend having the unit replaced. Some of the above problems may be addressed by simply cleaning your dishwasher. However, if cleaning doesn’t resolve the problem, consulting a repair expert is the better way to handle it so you can have your unit properly diagnosed and fixed.